Save 50% off on most DCS World products until 14 February 2019! The DCS: F/A-18C Hornet and DCS: Persian Gulf Map are available for 25% off. Take advantage of this great opportunity from here. Exceptions include recently released and pre-order titles: DCS: Christen Eagle II by Magnitude 3 LLC, DCS: F-14 Tomcat by Heatblur Simulations, and the A-10C Enemy Within 3.0 Campaign by Baltic Dragon. This weeks Open Beta update changelog can be found here. This week Baltic Dragon’s latest A-10C campaign was released that can be purchased here. 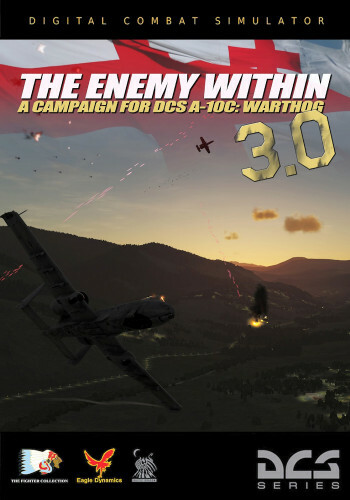 The Enemy Within 3.0 is a complete remake of the critically-acclaimed The Enemy Within campaign for the A-10C Warthog. This story-driven campaign puts you in cockpit of the Warthog as part of a small, 6-ship US detachment sent to Georgia. Your mission is to help contain a growing threat from a terrorist organization calling itself the "Caucasus Liberation Army" (CLA). As the story unfolds, you will be faced with a variety of challenges, including close air support, precision strikes, combat search and rescue, anti-ship strikes, and even air to air combat. We expect to see several of these items available this month. Wake Turbulence. Just like the wake behind a ship, an aircraft also produces a turbulence wake behind it, with the strongest forces coming off the wingtips as vortices. DCS World will now be modeling these as an option and will add a new level of realism and challenge when flying formations, aerial refueling, and air-to-air combat. Battle Damage Assessment. Displayed along the left side of the screen when a target is damaged or destroyed by the player, these notifications appear. A red notification indicates a destroyed target and a yellow notification with a percentage indicates a damaged target. When in the cockpit, it can often be difficult to know if a target was hit and damaged. This optional feature is provided to remove that mystery. The MiG-19P was originally planned for a release in January, but after an extensive review of the MiG-19, we and RAZBAM have decided to postpone its release until a few items are resolved. These include some needed improvements to the flight model and documentation. It’s RAZBAM’s desire to release the MiG-19P in a finished state so it will need just a little more time in the oven to meet this expectation.